If you have ever eaten a Pineapple then you are familiar with the Bromeliad family of plants. 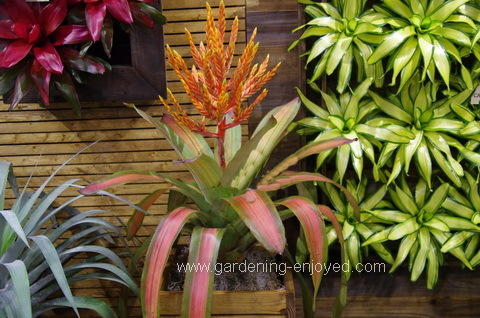 Most Bromeliads are grown for their wonderfully coloured leaves. The Pineapple is the fruit of the only edible Bromeliad that I know of. When I was visiting the Tropical Plant Exhibition a couple of weeks ago there were many booths displaying Bromeliads to be used as house plants. They provide a very colourful accent in the home with very little care and the coloured leaves, or bracts as we call them, last for many months. Most will eventually flower but they have this unfortunate habit of only flowering once and then they die. There are several different genera, (types,) of Bromeliads and this one is a new Aechmea named Patricia’s Secret. That bloom will probably last for a few months and then the whole plant will be done. Most Bromeliads will produce new small plants around the base of the original and they can be removed and planted when the main plant is finished. You can see several other Bromeliads in the background of this picture and most of them are grown for the coloured foliage. 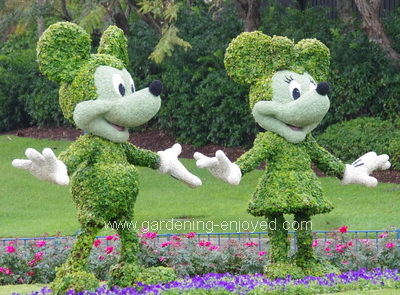 As houseplants they like bright light but not direct sunlight and they can readily be over watered. When the top 5cm (2") of their soil gets quite dry then they should be thoroughly watered until the excess runs out the bottom. If you can give them a higher humidity they will be a bit happier. This combination of bright colours and ease of care is making the many new varieties of this family very desirable house plants. They can also be striking accents in our outdoor containers. It won’t last forever so be ready to compost it after it has finished and then treat yourself to a different variety to bring colour and interest into the house. Down in the basement, under the lights and on the heated germination table, the several varieties of Begonia that I seeded early last month, are thriving. Tiny seed produces tiny seedlings and that’s why they get started so early in the season. There are hundreds of them and in some of my trays thousands. The boliviensis types are faster and thicker than the hybrid Tuberous types but all are now growing nicely. It will be some time before they get big enough to transplant and then the tricky part becomes separating this mass of seedlings into individual plants. 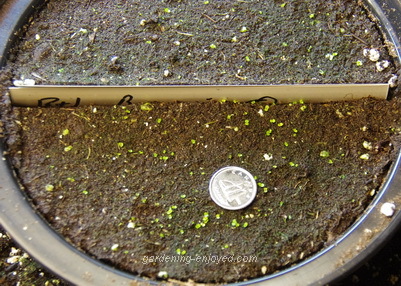 I tried to sow them as thinly as possible but that is one of the difficulties with the tiny Begonia seed. Last year I had a couple of plants of Non-stop Orange that were wonderful plants and I did manage to collect some seed and it has germinated well. The interesting part of playing with these seeds is to see whether the new plants are the same as their heavily hybridized parents. We won’t know that until June but the results are always worth the wait. Many of last years Begonias did not really thrive until they finally found a place outside in the warmth of the sun. My basement lights provide sufficient light for them but I need to find a spot where I can keep them warmer to see if that helps their early growth. There’s always another mystery to solve and a new technique to learn to get the best results. That’s what keeps me gardening. Last weekend I was “forced” to return to Florida to visit these two characters and stay in one of their resorts. The American Seed Trade Association was having their annual conference and the program looked like it would give me new ideas to talk and write about. Disney, obviously, has a huge horticulture program and we were treated to some speakers from that group and a couple of backstage tours. The backstage tour I was on was a bit of a disappointment in terms of seeing new horticultural techniques or research but then I admit to having been on enough tours over the years to have become a bit jaded. I can always learn something. I did find a seed company, not far from me, that is producing a very wide range oriental vegetable seeds. Who knew that there were about 17 varieties of Pak Choi available. The people at AgroHaitai are selling mostly to growers and to other seed companies but they do list packets for some of their varieties. I will be trying them out this year. I have been growing more of these Oriental Vegetables every year. They are, almost all, great cool season varieties and it’s nice to have such a diversity of food early in the season. They told me that the new smaller varieties were in much greater demand and I will be trying them in containers as well. All of the questions from the last issue were from people who were interested in how I made my own sub irrigation containers. Here is the new web page outlining my efforts.